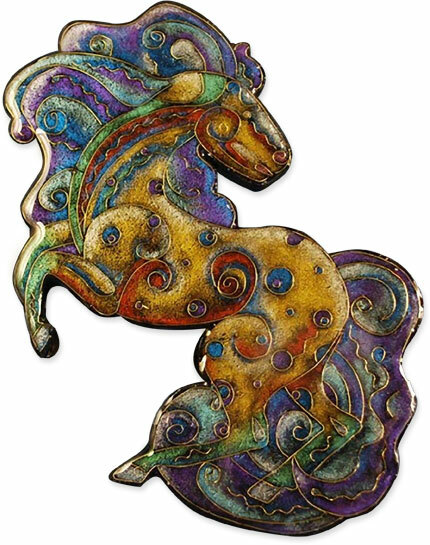 Equine artist Stephanie Michaud bought Eugena Topina’s faux cloisonné tutorial online. Eugena was surprised when Stephanie sent her first results which sold the first day they were offered on Etsy. This plaque is 7″ tall made of polymer, mica powders, artistic wire and resin. It’s marvelous when good teaching and a student’s passion for a subject collide.Wild horses can’t stop the magic. Proud teacher Eugena sent in the link. Samunnat’s building fund has received nearly $6,000 in donations from ten countries! Isn’t that remarkable? Yes, they are still accepting donations. Plant your flag on the list: US, Canada, Switzerland, Germany, Austria, Australia, New Zealand, Spain, Cyprus and the UK. what a great example of how ideas pollinate—this is a gorgeous example of faux cloisonne. Eugena should be justly proud of the new evolution. I just checked the Stephanie’s site and she is apparently sold out!